Branch Warren hasn't just put his stamp on the world of bodybuilding; he Fed-Ex-ed many of his competitors into oblivion. In 2011, he won the Arnold and the British Grand Prix. In 2010, he placed second at the Arnold and 3rd in the Mr. Olympia. In other words, his resume is growing as fast as his lat spread, which is wide enough to blot the sun. 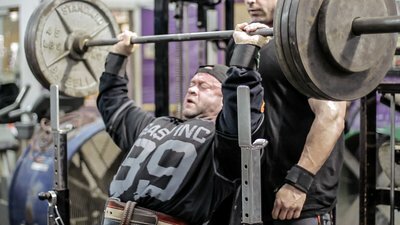 We joined Branch for a workout as he prepared to defend his Arnold Classic title. He decided to train shoulders, using weights most men don't touch for chest. His workouts aren't for the weak-hearted - don't be surprised if he reaches through the screen and uses you for a biceps curl. Watch Branch Warren trash it out in the gym.